From the acclaimed author of Hit the Target and Big Week, an in-depth account of the legendary World War II combat group, the Flying Tigers. In 1940, Pearl Harbor had not yet happened, and America was not yet at war with Japan. But China had been trying to stave off Japanese aggression for three years-and was desperate for aircraft and trained combat pilots. General Chiang Kai-shek sent military aviation advisor Claire Chennault to Washington, where President Roosevelt was sympathetic, but knew he could not intervene overtly. Instead, he quietly helped Chennault put together a group of American volunteer pilots. This was how the 1st American Volunteer Group-more commonly known as the Flying Tigers-was born. With the trademark smiling shark jaws on their P-40 fighters, these Army, Navy and Marine pilots became a sensation as they fought for the Chinese. Those who initially doubted them were eventually in awe as they persevered over Rangoon despite being outnumbered 14-1 by Japanese aircraft; as they were described by Madame Chiang Kai-shek as her "little angels" and by a Chinese foreign minister as "the soundest investment China ever made"; and as they ultimately destroyed hundreds of Japanese planes while losing only a dozen of their own in combat. Two of their veterans would later earn the Medal of Honor-and as a group, the Flying Tigers managed to rack up a better record than any other air wing in the Pacific theater. 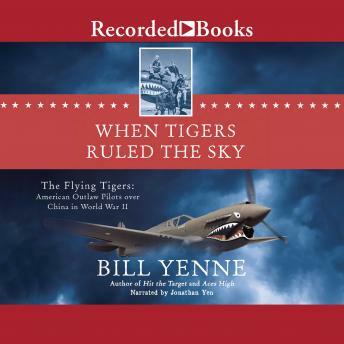 When Tigers Ruled the Sky is a thrilling and triumphant account of their courage and their legacy.